Our database has grown by three stadiums overnight. Two of them are connected to Manchester City – old and new reserve grounds. The third is new, but hopefully only temporary Barnet FC home. Formally it was delivered last week, but will see its first game tomorrow. Two games, actually: male and female teams of City and Manchester Metropolitan University will clash to celebrate partnership between the two institutions. The new stadium for reserves/youth/women of Manchester City stands just 300 meters from Etihad Stadium and is part of one of the world’s best training complexes, the Etihad Campus. 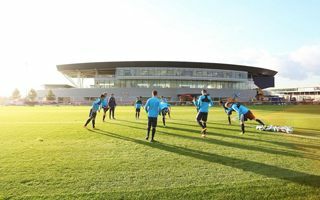 The complex consists of 14 full-sized fields (aside the one at Academy Stadium), education rooms, medical and fitness center and offices of the club – all covering 32 hectares. Construction on the entire plot began in 2011, but the stadium itself needed less time and began growing in mid-2013. Despite its oval shape, all stands are separate. Those behind goals are terraced, the ones along both sides offer seating, combined offering 7,000 capacity. The east stand comprises club offices, skyboxes and vast media hall with an overview of the field. The west side offers significant commercial space along the Alan Turing Way. This project’s history begins in 2003, when groundbreaking took place in northern London. Initially it was supposed to become the home of Wealdstone FC, but the club’s commercial partners went into liquidation, stopping the development. Entire site was made available in a tender in 2006 and Barnet FC took over in an attempt to leave their dated Underhill Stadium. The club succeeded and opened the entire complex in 2013. The stadium has seated grandstands on both sides of the pitch, mostly covered, while both ends are occupied with terracing. The eastern side is conjoined with a vast pavilion, which comprises a fitness and medical centre. Together with 8 full-sized pitched, the site is one of London’s best football complexes. Eventually Barnet FC hope to leave the site. The club hope to establish a different stadium for themselves elsewhere in the borough of Barnet, nearly twice the size of The Hive. Built back in the nineteenth century, this stadium in eastern outskirts of Manchester has served as home to Hyde United since 1919. The host only changed when United were rebranded to Hyde FC in 2010. The shift was associated with Manchester City partnership. That large club saved Hyde from bankruptcy and renovated the stadium, changing red colour of the facades and roof to blue. City’s crest was also established on the ground as it served as home venue for the club’s reserves in 2010-2014. Ewen Fields has a very unusual layout: the main grandstand is in the east instead of west, the north end stands askew instead of parallel to the field, while there are 5 stands in total, not 4. As if this wasn’t odd enough, the most popular Shed End is called an end despite not being one – it runs along the pitch, near the north-east corner.